Posted by Gina Rubel – Check it out – what a fun PR application http://www.spinspotter.com/. It’s said to spot spin and bias in news coverage. The “spinoculars” help you spot spin but they’re only available right now for FireFox 3. The site says they’ll be adding the ap for IE 7 soon. Spin doesn't belong in the news. It's like putting motor oil in the mojito. We have tremendous respect for journalists, but who would argue that the media circus isn't out of control? A full 66% of Americans think the press is one-sided. Now there's a website and software tool that exposes news spin and bias, misuse of sources, and suspect factual support. 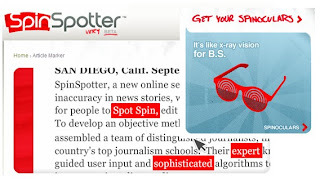 At SpinSpotter, you'll experience the news in a profound new way. Yes, the truth is back in town. Penny 1) This could be an interesting public relations tool to measure the message in media coverage – we’ll have to wait and see. Penny 2) Don’t mess with the mojito!